Many of my younger students are composing their own piano pieces this summer. We start with easy, manageable composition projects that are quick and fun to do. But the creativity ignited by realizing you can make your own music, and not just play what someone else has written, can shape a pianist’s musical journey for a lifetime. Christopher composed his first piano piece this week with some prompts from a composition worksheet provided by TeachPianoToday.com. 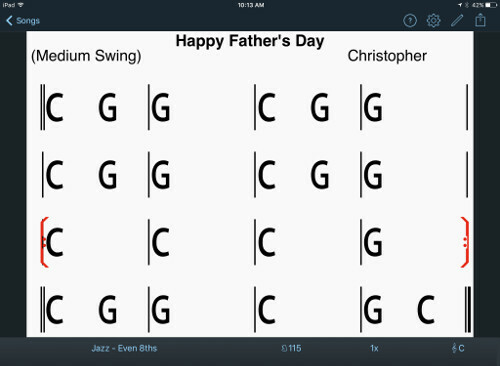 After completing the piece (notating it all by hand), he analyzed the chords he’d used, then created a chord chart in the iReal Pro iPad app. The app generates an accompaniment based on the chord chart, so here’s Christopher playing his piece with rhythm band accompaniment. Next week he’ll use MuseScore software to create computer-generated notation for his piece. I went to the cabin and swam. I went to the pool with my friends. Yeah! Writing lyrics first helped Logan create a melody with interesting rhythmic patterns, simply because the natural cadence of the text dictated the rhythms. So far, she’s written out her melody only with finger numbers. In her next lesson, I’ll help her start writing actual notation. Logan used a composition worksheet from MyFunPianoStudio.com for guidance and prompts to get started.